Baron Uilliam Mac-an-tSaoir reported on the most recent Heavy Weapons Muster. On February 15th, a muster was held in the Barony-Marche of the Debatable Lands to continue the task of preparing Æthelmearc’s forces for War. 48 unbelted fighters and 13 members of the Chivalry gathered at an indoor site for the muster, which was hosted by Sir Thomas Byron of Haverford and Sir Ariella of Thornbury. The day began with a round robin tournament for 30 of the unbelted fighters. Though some of the combatants didn’t get to fight everyone, over 500 fights took place in an hour. This was a great warm-up for the scenarios that would follow. – Video courtesy of Licia. Sir Stefan Ulfkelsson, Kingdom Warlord, called the fighters to the center of the hall, stating that Æthelmearc had shown its strength and tenacity in bridge and limited front battles, so we would work on improving our open field tactics. With that, the fighters were divided into those from Æthelwald on one side and those from Langstrand and Mearcfells on the other. – Video courtesy of Baron Torvaldr Torgarson. After several open field melees, we moved on to small unit scrambles. The fighters were divided up into smaller units and each unit was given a number. As the numbers were called, the units with those numbers crossed the field to fight each other. Once a team had won, they would have to quickly regroup and prepare for the next challenger. Later, we used those same small units to reinforce each other and build on the tactics we learned, both in field battles and limited front battles. 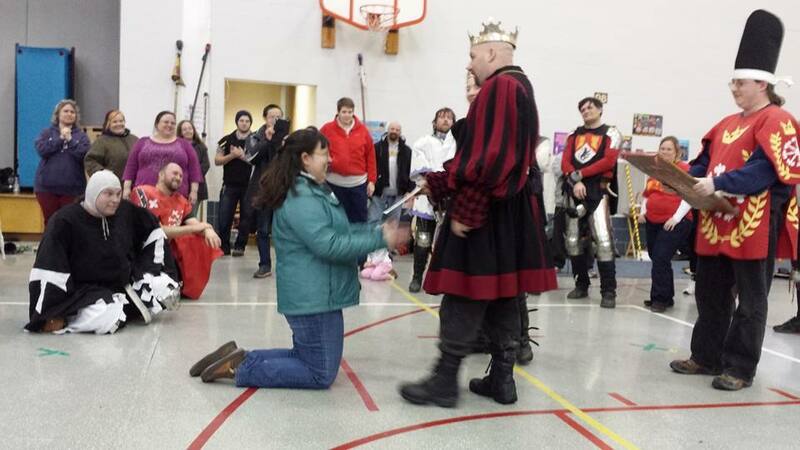 Lady Angel of Gabriel’s Landing receives her AoA scroll from Their Majesties. Photo by Baron Uilliam Mac-an-tSaoir. At the end of the day, Their Majesties arrived and bestowed award scrolls on some gentles they had missed in courts earlier in the reign, including an Award of Arms for Lady Angel of Gabriel’s Landing. All in all, there was plenty of fighting and a great opportunity to learn and grow as an army.